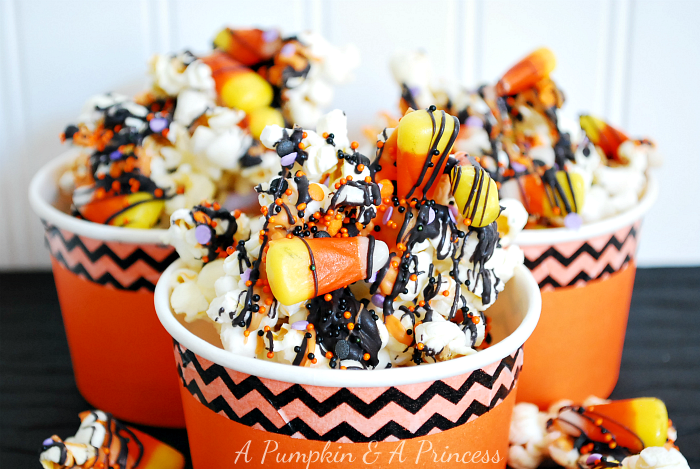 My bloggy friend Crystal of A Pumpkin & A Princess is on the blog today showing us how to make a yummy Halloween treat. I just adore Crystal and her pictures are always so beautiful! Don’t forget to link up your Halloween crafts, recipes and decor HERE. I’m excited to be here today as part of Vanessa’s Halloween series. 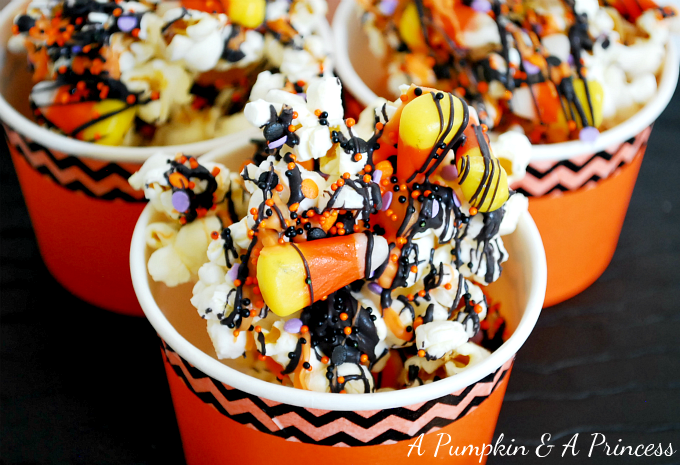 Today I’m going to share with you an easy Halloween treat that’s perfect for Halloween parties or an everyday treat to enjoy with the kids. I began by popping 1/2 cup of popcorn kernels with 3 tablespoons of oil. Once my popcorn was ready I threw a quick dash of salt on top to help balance out the sweetness. You could really add any toppings you’d like, for this particular recipe I used Wilton Candy Melts, candy corn, and various sprinkles. I melted the candy melts in separate bowls over a double broiler. Using a fork for each one I drizzled the candy melts on top of the popcorn. You could use a piping bag but this works just as well. After I drizzled the candy melts I quickly added the candy corn and sprinkles on top. I had a little bit of melted candy leftover so I drizzled the remaining on top of everything. 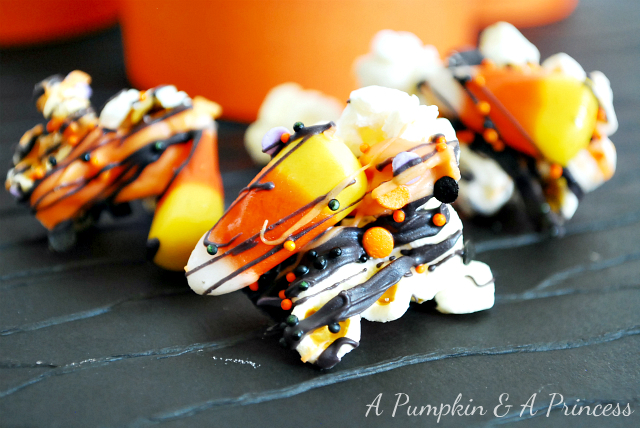 The candy melts will harden and then you’re ready to enjoy a tasty Halloween treat! My kids love this stuff and I like how easy it is to make. Hi See Vanessa Craft readers, I’m Crystal! I’m a mom to three cuties, a wife, and the writer behind A Pumpkin & A Princess. I have a passion for creating anything and everything from adorable holiday crafts to delicious treats to share with my family. Thanks for having me and a big thank you to Vanessa for inviting me over. I hope you can stop by sometime and say hi! You can keep up with more of my Halloween ideas like my Spider Pumpkin and Trick or Treat Frame on Facebook, Twitter, and Pinterest. Happy Halloween! So festive looking! And I know it must taste yum-yum-yummy! My girls will love this. Thanks for sharing! Mmmmmmm, that looks so good!